Using the Internet to find information about my domain name case has shown me again what a great thing the Internet is in sharing information, making it available and being able to find it. I wish everybody visiting this page (more visitors then I expected) Prettige Kerstdagen en een Gelukkig Nieuwjaar / a Merry Christmas and a Happy Newyear. I received a letter from a lawyer representing the publishers of Asterix & Obelix basically telling me that IDEFIX is their trademark in certain areas and that since I do nothing serious with idefix.net I must be holding it to mislead people searching for information about idefix so I should give up the domain name for free to them right now. I'm looking for legal help on this matter. I also updated the main page to help other people who cannot think further then a domain name being for a website on www.domainname/ (mutter mutter). My page in the Elite Warez Network at Cetis has been removed. The other place you can still find it is http://www.bofh.net/~koos/warez.html. Received the DVD of Creature Comforts today. It's some of the older stuff from Aardman Studio's and it's really great. Small update on the GSM as GPS project after playing for a while with a phone and a datacable. I had my first snowboard lesson today at skipiste nieuwegein. Baaaad experience with restaurant Dulac in Amsterdam. Eeeeew! Never again. NAIT filed for bankrupcy, so out of a job again, looking at my possibilities. My cats went for a checkup, and they are ok. They just really really really dislike the vet. Idefix is now [URL expired] download mirror for Opera for Linux. Slight update to the page of Sending e-mail from Oracle PL/SQL stored procedures. Have a good laugh, visit the [URL expired] top ten lists. The idea for the GSM as GPS project. New books and more updates for The Virtual Bookcase. Have a look, you will like it. I am self-nominating for ICANN membership. Read my reasons why. Updated stuff behind The Virtual Bookcase so it is now more flexible and better. Mirrorred television samples of Enschede available at [URL expired] ftp.cetis.hvu.nl/pub/enschede. New style homepage. Because I felt like it. The banner above is because Saturday May 13th 2000 a big disaster happened when a large fireworks storage exploded in Enschede killing at least 17 people, wounding over 900 and destroying 400 homes. A new e-mail virus is going around since this morning ... I wrote a quick fix using sendmail .mc files. How to eliminate capslock in X.
I am leaving Cetis/Hogeschool van Utrecht and changing jobs. 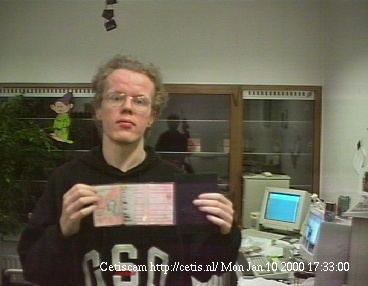 My work at Cetis will end around the end of May 2000. No America plans anymore but a needed change in my work. I removed the Cetis webcam. The Virtual Bookcase has been restyled and got it's own domain-name and webserver at http://www.virtualbookcase.com/.. come see what is new! Ik heb m'n rijbewijs eindelijk! This page generated by $Id: morenews.cgi,v 1.45 2019/04/02 09:26:15 koos Exp $ in 0.051050 seconds.